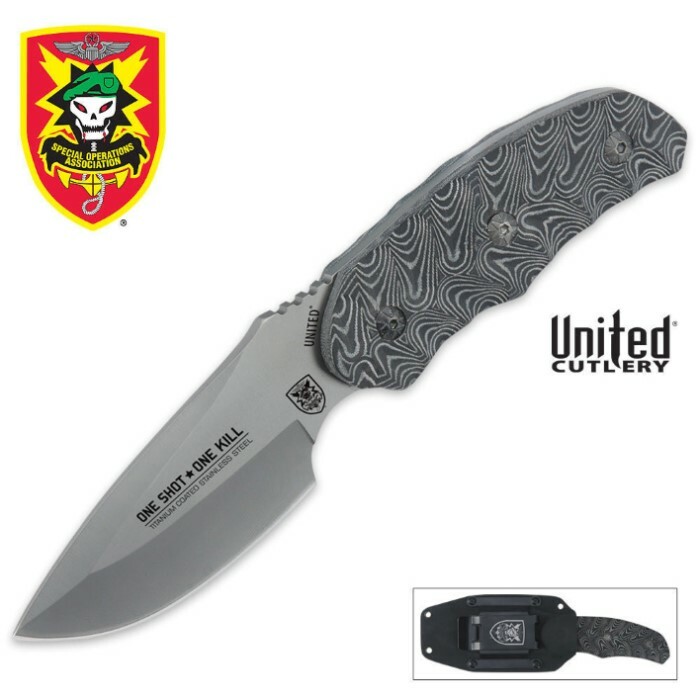 United Cutlery SOA Titanium Coated Micarta Handle Fighter Knife Kydex Sheath | BUDK.com - Knives & Swords At The Lowest Prices! "Death Waits in the Dark," has a grey titanium coating to reduce glare and prevent corrosion. This S.O.A. tactical fighter features a contoured premium Micarta handle which not only gives this knife a tactical appearance, but is also slip-resistant and extremely easy to grip even while wet. I can't say enough about how freakin awesome this knife is! Heavy duty, sharp, slip resistant even when wet. When you put the knife in the sheath there is a prominent snap where the kydex sheath snaps tight and holds the knife, the belt clip fits on about any belt and STAYS there. Super cheap price for the quality you get. If you are trying to decide on a knife to buy, definitely get this one, you won't be sorry. I love it! This knife is sweet man! the handle is vary sturty,the blade is sharp, & the kydex sheath holds the knife vary well.I recommend this knife 2 any one! Fantastic knife. Overpriced here. Skinner blade is not the least similar to fighter's blade. Alfa Benetti sells a thicker, beefier version oF this exACT skinner on KNIFE CENTER for 15 bucks. Buy it here or there. Awesome, awesome slab of reliable steel!! This knife if pretty awesome, it came fairly sharp and has a nice, heavy, rugged feel to it. This knife would have been a five star for me if it only had to more features, I prefer a serated blade, so it would javelin been nice if it came with the option of serated or straight edge, and reason #2 is I wish it had a lanyard hole, over all a great knife especially for the price, I Recomend! !